Based on the regular sources, and in this case especially from examining Apple's deals with other companies, here's what you can expect to see on March 25. We most likely won't get any more hardware announcements at the event, but in that regard, there are still many products due to come during the rest of the year. 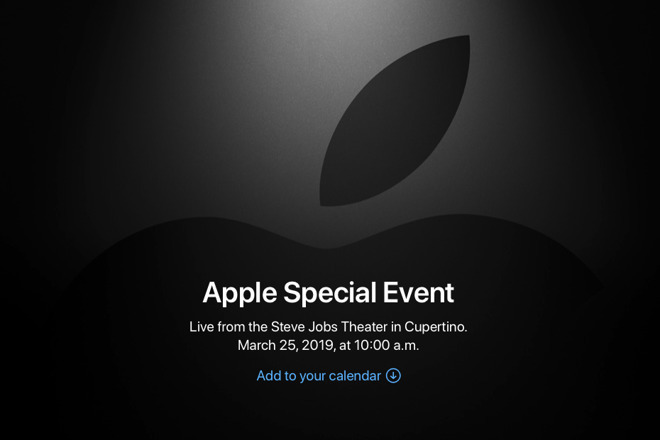 Continuing Apple's penchant for cryptic invitations, the one for the March 25 event is headed "It's show time." The invitation isn't a static image, though, nor is it quite like last October's event where hundreds of different images were then made into an animation. This time Apple ran an old-style film countdown before unveiling a regular white Apple logo on a black background. Given the word 'show' and the film-style intro, it does look as if this event will be all about Apple's forthcoming video service. However, prior rumors about the event kept repeating that the real highlight of the launch event will be Apple's subscription service of newspapers and magazines. What's most likely is that at various times in the last few months, Apple has not been certain of exactly what news it would be able to show about its video service. While the service itself is a technical challenge and Apple is extremely used to those, it also depends on the service's programming. Apple has made videos for decades but never on this scale and you can't become a major studio overnight. Apple has been commissioning dramas and comedies, plus it's been negotiating rights in a new and enormous field where it is competing with very different players than its used to. Now, though, we know that there are at least 11 shows that have either been finished or at least have wrapped principle photography. This means Apple has footage to show plus, of course, it has all of the cast and crew talent that it has hired. So if you have a billion dollars' worth of shows to pick from and you can have the likes of Oprah Winfrey, JJ Abrams, Jennifer Garner and Steve Carrell at your launch, Apple's video service is going to outshine any newspaper subscription package. This is not going to be another AirPower or even Mac Pro situation where Apple announces something and then we have to wait years to see it. The video streaming service will be coming as soon after this March 25 event as humanly possible. Or in theory it will be, anyway. There have also been reports that claim the service won't launch for another several months. This is probably down to the same uncertainty over what deals were going to be ready in time, but not definitely. While we have certain specifics such as Netflix saying it will not provide programming to the service, it's likely that many deals will still be being negotiated even now. So Apple will have more than enough material to announce, but it's still possible that the service may have to start small and ramp up as deals are confirmed. If the video service is surely, inevitably going to dominate Apple's launch, we are still expecting to see the unveiling of its expanded news and magazine offering. From those ">publishers who are balking at the deals Apple is offering, we know that Apple has been offering deals for what has been rumored to be called "Apple News Magazines". That name was seemingly confirmed in beta versions of iOS 12.2 which also indicated that payments will be linked to your iTunes account. There also appears to be what's going to be called a bundle subscription, which could mean one fee for "Apple News Magazines," Apple Music, and the forthcoming Apple video service. A subscription to "Apple News Magazines" by itself is rumored to cost $10 per month, the same as an individual subscription to Apple Music. 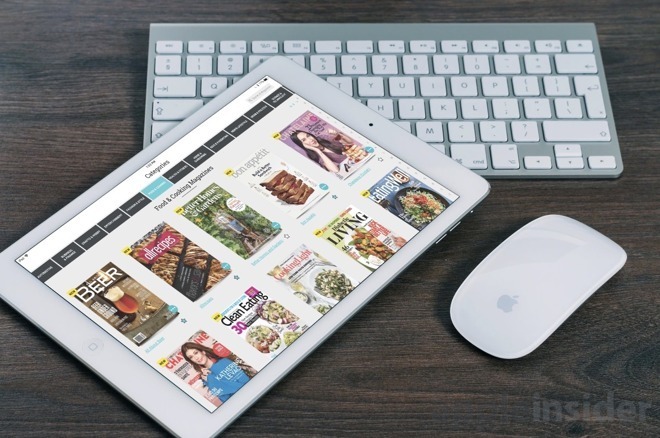 This follows Apple's acquisition of Texture, a service that offered access to magazines. The Apple version is expected to continue with magazines but also add newspapers. However, there are reports of issues over just how it will do that, and specifically which titles it can carry. Reportedly, Apple is planning to take 50 percent of the income from the subscription and at least some publishers are balking at that. We've seen small and hardware large updates in the week leading up to this March 25 event, and that would seem to make it certain we won't get any in the event itself. Hardware will not be completely absent, however, as if Apple has the world's attention focused on the shows its commissioned and the stars who've made them, the company is going to make it clear just what devices you should watch them on —and that means Apple's gear, at least to start. It's never just a case of what's ready to be launched. It is always a case of what Apple can make the most impact with and that involves both launching major products and making sure that they don't compete with each other for attention too much. Apple wants everyone buying everything, it doesn't want us diverted by too many options. That makes us interested to see how it will present both the video and the news services. The most likely route is for the company to talk up the news service first and then move on to the bigger part of the event. However, this event is going to get even more attention than usual because of the talent making the video service. That might well make it irresistible for the firm to double down on how it uses security as a selling point for its devices. Early in March 2019, the company bought and registered the website domain name PrivacyIsImportant.com. There's still nothing on that site, nothing whatsoever, but we can well see Apple launching it at an event. We'll know on March 25 and Apple has announced that, as ever, the event will be streamed live. It'll be on the company's website but, of course, also on Apple TV.